On the face of it the results from today’s Sunday Business Post/ RED C poll are not that exciting, with small gains or losses within the margin of error for each party. However, longer term trends and some extra questions on voter commitment added to this wave, provide a much more interesting analysis of the current political battleground, with some serious concerns being raised for Labour TDs and a wider warning for the government coalition in general. Firstly let’s take a look at the long-term trends in party support. Fine Gael is relatively stable in the longer term, with small moves in support when the electorate hears either positive or negative messages, and more recently has had positive gains. News of a “special deal” for Ireland emanating from Germany last weekend has certainly helped to push the Fine Gael vote back up to very healthy 34%, not far behind where they stood at the general election eighteen months ago, and as yet the party support doesn’t seem to be impacted by early budget leaks. For Labour the picture is not so rosy. In isolation a 1% decline this month, to leave their first preference vote at 13% isn’t a disaster, but the longer-term trend remains downward, and at a time when their coalition partners are making gains, this is even more distressing. The danger for the party in the long term is that they are punished, as the smaller partner in government, where they get blamed for not getting their way on certain issues, and don’t get the benefit of positive government announcements. It is highly likely that Labour party members of the cabinet were in some way involved in the deal with Germany and France, but the kudos has gone Kenny’s way, with no crumbs falling from the table for the smaller coalition partner. The fact that Labour’s decline is the reverse of the two main parties in opposition is equally difficult for them. Sinn Fein has been gaining support over the past 18 months, and while dropping back this month, their standing is still well ahead of what they achieved at the last election. Likewise Fianna Fail could also be seeing some small green shoots of growth in support. This month they secured 19% first preference vote again, their high point since the election, which they last achieved four months ago. More interesting though is that if we were to apply the RED C spiral of silence analysis (that allocates 50% of voters saying they don’t know or refuse to tell us how they will vote, back to the party they voted for previously), based on 2007 vote behaviour rather than 2011, they could be as high as 21%. This is because a large proportion of current undecided voters, are those that once voted for Fianna Fail, and if the party can get some kind of momentum in being seen as credible once again on the back of this analysis they could make good gains. More worrying for Labour is the response to our two extra questions this month. Asked whether the country was going in the right direction or was on the wrong track, the overall results see 50% suggesting Ireland is on the wrong track, with 41% suggesting we were going in the right direction, and 9% undecided. There are more people who think we are on the wrong track; but this result is actually slightly better than currently seen in the USA for instance, where the poll average is 54% wrong track, 40% right direction. It is not surprising after undecided voters are stripped out, that Sinn Fein voters are most likely to believe we are on the wrong track (90%), and that the majority of Fianna Fail voters also feel we are on the wrong track (65%); but a real worry for Labour is that the majority of their voters also believe we are on the wrong track (59%), and it is only among Fine Gael voters where we see wrong track in the minority (23%). Finally there has been some discussion that part of the reason for the coalition’s success in holding on to poll numbers, is the lack of a credible opposition. 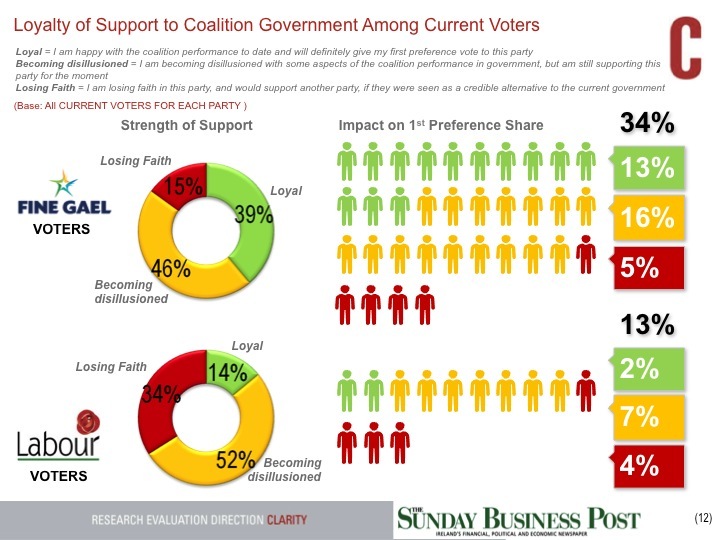 With this in mind we asked those voters currently supporting the coalition government how strong their support was. We split voters into three sub groups, those that were very loyal stated that they were happy with the coalition performance to date and that they will definitely give their first preference vote to this party, those that were becoming disillusioned with some aspects of the coalition performance, but were still supporting the party for the moment, and those that were losing faith in the party, and would support another party, if they were seen as a credible alternative to the current government. While on a relatively small baseline of just one poll it threw up some interesting results. Fine Gael voters were on the whole a lot more loyal than their Labour counterparts, with 39% of supporters loyal vs. just 15% of Labour supporters. But the starkest message was that over a third (34%) of the current Labour support is losing faith with the party, and suggest they would support another party if they were seen as a credible alternative. 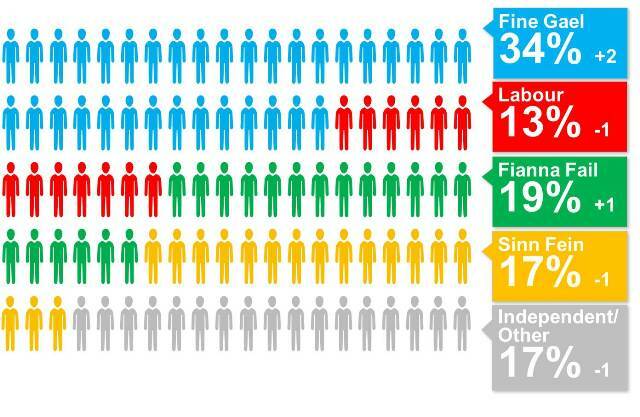 To put this into context, were these voters to jump ship it would leave the party with just 9% first preference vote. Underlying this headline grabbing finding for Labour, is also the fact that over half of ALL the coalition voters are either becoming disillusioned or losing faith in the party they currently state they are supporting. This appears to underpin the feeling that Ireland is coming to the end of its tether with regard to austerity, and suggests that the forthcoming Budget could be breaking point for many.